A 42 year old white male was wearing flip flops and as he was walking down his basement steps, his foot slid down the steps and hit the heel of his left foot on the next descending step. He went to the emergency room of the local hospital and had x-rays which failed to show any pathology including fracture. In the emergency room he was given crutches along with an immobilization wrapping around his foot and lower leg. He was told to stay off his foot. At that time he was also given a prescription for Percoset tablets for the pain. One week later he presented to our office in a lot of pain. He had not been using his crutches and is in a line of work that requires a lot of walking. During the exam it was noted that the majority of his pain was on the bottom of the heel, but further back from where the plantar fascial ligament attaches to the heel. In spite of the amount of pain he was experiencing, there was no overt sign of inflammation in the heel area; it was not red, hot, or swollen. Between the time the patient was seen in the emergency room to the time he came to our office he had done a lot of research and spoke to a few people and was convinced he had plantarfaciitis. So convinced in fact that he pretty much dismissed my suggestion that I did not think it was plantarfasciitis. In any event I applied a low-dye strapping which essentially attempts to force the fat in the heel area to stay on the bottom of the heel and not displace away from the bottom when the patient bears weight. In addition to the Percoset, I gave him a prescription for Mobic tablets which is an anti-inflammatory medication. I told him he needed to stay off his foot but he explained that his job required he walk and that since it was a new job he did not want to risk losing it. I saw him back in a week and he was no better and perhaps even in more pain. Any doctor who treats the same medical condition over and over again has a certain level of expectation as to the progress the patient is making. In this case, there was no progress, so in spite of a normal x-ray in the emergency room, I suspected more than just a bone bruise. We sent him for an MRI to rule out heel fracture or even a tear within the plantarfascial ligament and sure enough he sustained a fracture of his heel. 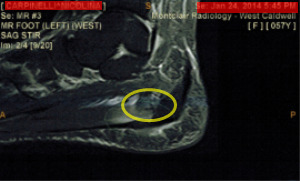 Look at the yellow arrow on the MRI and you will notice a vertical crack in the heel bone. Once I reported to the patient that he had a heel fracture, he started to take my advice seriously. He went non-weightbearing on crutches and was forced to do his job that way, which all of a sudden he seemed able to handle. I am presenting this case because I think it is important for people to understand that not all pain is the same condition. Plantarfasciitis is a very popular diagnosis these days, but just because you have heel pain does not mean you have plantarfasciitis. If you are having heel pain that does not seem to respond to the more common treatment modalities available, then the problem has to be examined in more depth. A 57 year old women slipped in a parking lot and immediately began to experience pain in her left heel. Approximately one week later she appeared in our office complaining of pain on the bottom of the heel. X-rays were negative for fracture. Because of the amount of pain she was in and due to the fact that there was a history of trauma, we put her in a walking boot along with a prescription for anti-inflammatory medication. The patient was seen back in the office in four weeks and at that visit complained of ongoing pain which had not diminished much during the previous four weeks, although I am not sure she was wearing the walking boot as religiously as she had been instructed. Since the degree of improvement proved to be marginal, an MRI was ordered. The following MRI reveals a small tear in the central slip of the plantarfascial ligament at its insertion into the heel. 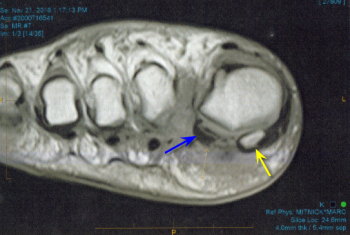 The MRI also reveals bone marrow edema at the insertion of the plantarfascial ligament into the heel bone. This essentially indicates that there was stress to the calcaneus (heel bone) but not enough to create an out right fracture. 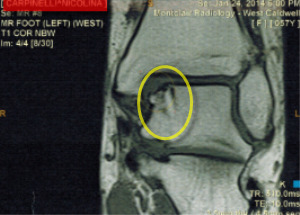 An incidental finding of osteochondritis dessicans was observed on the MRI. This a defect in bone, usually occurring in the talus bone which is the bone that makes up the floor of the ankle joint. This type of problem generally occurs from a twisting motion in the ankle sustained during trauma. In this particular instance, this problem was identified as a chronic problem and not associated with the patient's recent trauma. A 70 year old women was seen in the office complaining of pain in right forefoot. This patient has been a patient of mine for years. She is very athletic and naturally not overweight. There was no specific incident that initially caused her pain, but she related that the front of her foot only hurt her while she was on the treadmill and pretty much did not bother her otherwise. Her pain was limited to the area on top of her foot just behind her third toe. There was a minimal amount of swelling and a slight sign of erythema (redness). Palpation on the area resulted in discomfort. Typically, in cases like this the diagnosis is usually one of either extensor tendonitis meaning an inflammation of the tendon that brings the toes upwards. Tendonitis is very common in people who are athletic but of course it can occur in anyone. The second possibility was that of a stress fracture. A stress fracture is usually a crack in the bone that occurs without any history of trauma. As the name implies, if a bone is overstressed it can fracture. I started the patient on an anti-inflammatory agent, as well as advising rest and limiting ambulation to necessary tasks. She was sent for an x-ray which came back negative for any pathology. Thus, the working diagnosis became one of tendonitis. In spite of the anti-inflammatory medication and rest, the foot did not improve over the next couple of weeks. Most doctors expect a predicted response when they initiate a treatment plan for any medical condition. If their expectations are not met, the doctor needs to go to Plan B. In this instance I sent the patient for an MRI essentially to get better detail of what might actually be going on with the right forefoot. The MRI came back as a stress fracture of the third metatarsal. If you look closely at the yellow arrows on the MRI you will see a crack in the bone at the tip of the inferior yellow arrow. I bothered to include this case because I get a lot of people writing to me stating that they had sustained an injury, or perhaps had foot pain without any history of injury. They go on to state that they had an x-ray which did not show any sign of fracture, but they still continue to experience pain weeks after the first instance of pain. In cases of stress fractures, sometimes the fracture will not show up initially on x-ray. It may take a second x-ray 10-14 days later to show signs of fracture. Even then the x-ray may still look normal. If this is the case and the pain continues, then an MRI or CT scan is indicated which will give better visualization of the bone. Additionally, if the pain is not related to bone, but perhaps soft tissue surrounding the bone, these tests will also give your doctor a better idea of the health of the surrounding tissue. A 26 year old female presented to the office complaining of severe pain and swelling near the big toe joint of her left foot. She stated that she had stepped on a piece of glass a couple of days earlier, the area had bled a little bit, but she was unable to remove any glass. Twenty four hours earlier, she was in so much pain that she went to the Emergency Room of a local hospital where the foot was x-rayed. The ER physician thought she might have fractured her lateral sesamoid based on the central point of pain and the fact that the x-ray was suggestive of a possible fracture. She was put on crutches, given a prescription for Naproxyn to reduce the inflammation, as well as a prescription for Clindaymycin since a possible infection secondary to stepping on glass, could not be ruled out. When the patient presented to me the following day, even though she had been on crutches for 24 hours, the forefoot in the area of the big toe joint was very much swollen and very much tender to touch. There was even some erythema, although it did not look like true cellulitis, on the top of the foot between the first and second toes. I was unable to find any sign of a previous focal point for a foreign body (glass) and so even though I had to keep it in the back of my mind, I did not think the pain and swelling (and redness) was from an infection. She also was not running a fever. 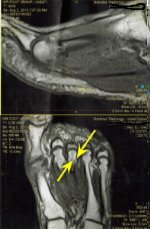 The most painful area of the swollen part of her foot appeared to be in the area of the fibular (lateral sesamoid bone). People in my specialty see a lot of sesamoiditis and there was way too much inflammation to be sesamoiditis. Plus, she had not done anything physically out of the ordinary over the last few days, other then yoga. So, yes there was the possibility of a fractured sesamoid, but again there was no excessive activity the last few days. Plus, she also had some symptoms of turf toe as there was pain, to a lesser degree on palpation of the capsular ligament. Since I did not have a definitive diagnosis and since there was so much pain, I ordered an MRI with contrast. The report came back as avascular necrosis of the fibular (lateral sesamoid) which means the blood supply has been cut off to the sesamoid bone. 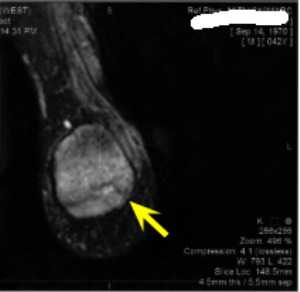 If you look at the MRI film below, the yellow arrow clearly shows the tibial sesamoid (medial sesamoid), while the blue arrow shows a gray shadow representing the diseased fibular sesamoid bone. Treatment consisted of taking her off the Clindamycin, to remain on crutches as much as possible. I also gave her a temporary orthotic with a cutout around the sesamoids, simply because she has a young child at home and there are instances where she is going to have to bear weight. I kept her on Naproxyn and saw her a week later. At that visit the swelling was dramatically reduced, there was less pain on palpation and she was able to bear some weight on the foot. We will keep her on this regimen for four to six weeks, then re-evaluate her situation.